Strawberry Biscuit Blog Hop! Here's what I made! 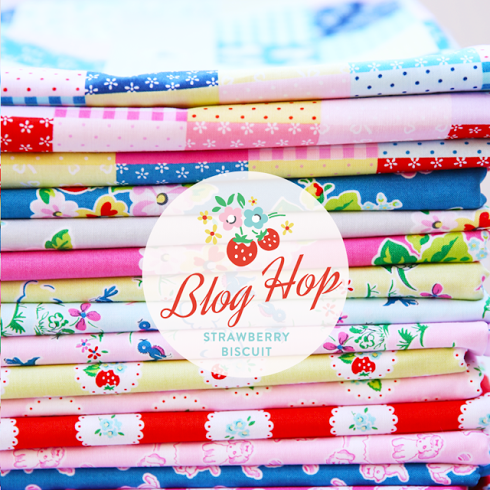 Hello Friends and welcome to the Strawberry Biscuit Blog Hop! 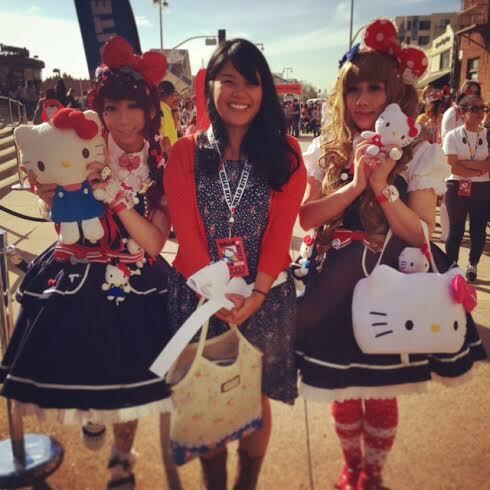 I have to say, it's been a while since I've blogged, a long while. There's a good reason I've been away so long. I'm about 33 weeks pregnant......with TWINS, a boy and a girl! I've been over there on that Instant thing...yep, Instagram. What can I say, it's fast and easy. But it's been enough time where I've decided to blog once again. Instagram can only show snippets of projects, where as here I can show you the whole process without blowing up your feed! 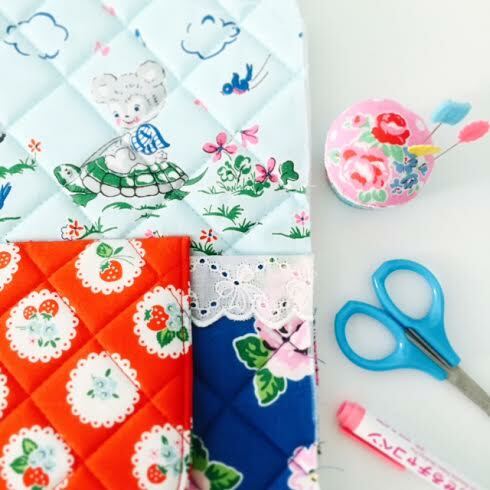 So, when I was asked by the lovely and talented Elea Lutz to join her bloghop for the release of her new fabric line "Strawberry Biscuit" for Penny Rose Fabrics, I couldn't turn her down (third trimester and all!). I'd have to say, this line is so cute, dainty, inspiring, and was such an honor to create with. There's been some beautiful creations out there with Strawberry Biscuit. I can't wait to see more! So, here's what I made! 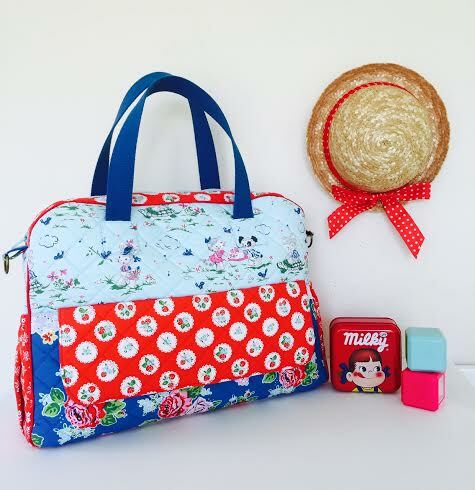 Handmade diaper bag in Strawberry Biscuit! Two front pockets that can hold keys, cell phone, toys, and more. Backside inner zippered pocket in grey main rose print. 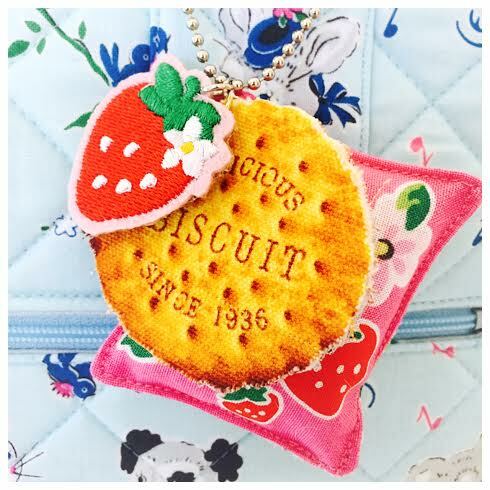 Strawberry Biscuit key chain detail. 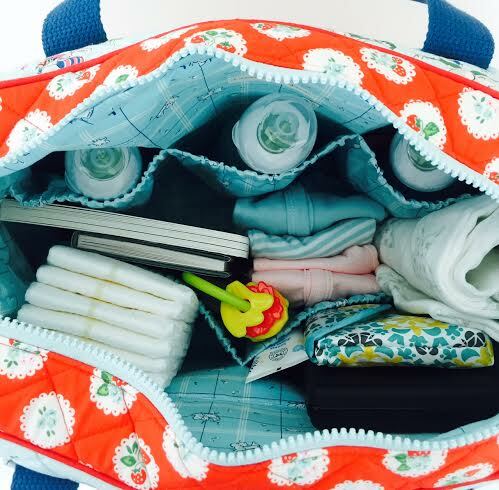 Inside of bag which can hold plenty of your babies needs. Since this might be my last big sewing project for a bit (wait a minute, I still have two baby quilts to make ahhh!! 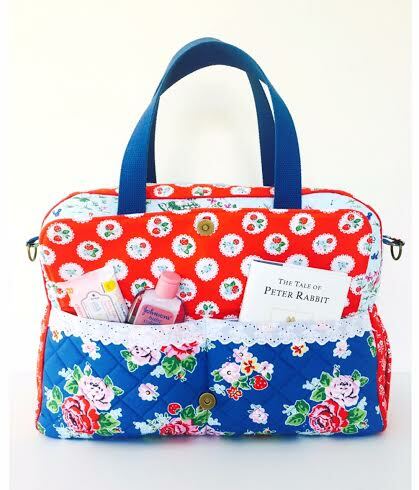 ), I decided to go out with a bang and create a diaper bag for my twins. I truly love making bags. It's one of my most favorite things to sew. 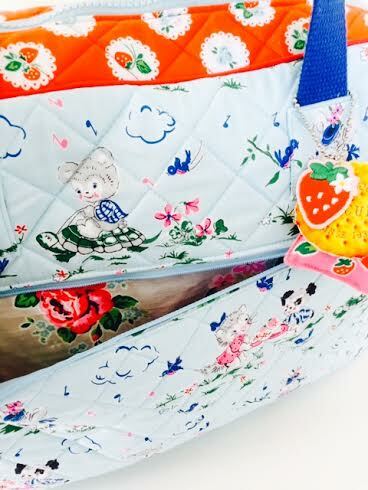 What I love most about Strawberry Biscuit fabric, is that the colors and details in this line can do double duty for girl and boy creations! So, I decided to go with the blue and red tones. Detail of front pocket flap. Detail of backside of bag. Detail of side pockets that can hold bottles, toys, and, more. Detail of side and top zipper. I love this zipper! Detachable strap with brass swivel hooks. 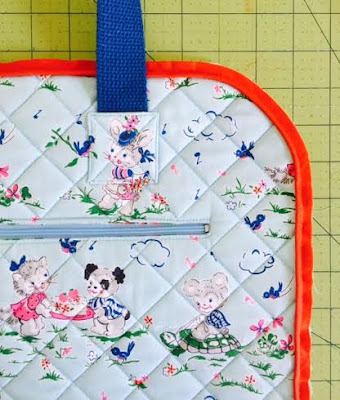 I wanted the bag to be heavy duty since I'm going to be stuffing it with twice as many bottles, diapers, and clothes, so I decided to use thick Pellon Flex Foam interfacing and quilted it to make it extra sturdy and cute of course! This material truly is a dream to work with if you are looking for a lot of body for a bag. front, as this is the start of inspiration and design for the entire bag. 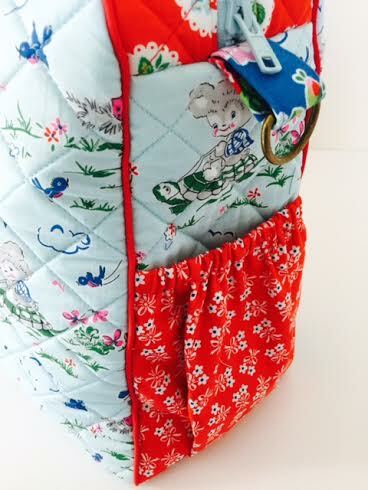 I added a large front flat pocket, that can hold little books, keys, cell phone, pacifiers, etc. 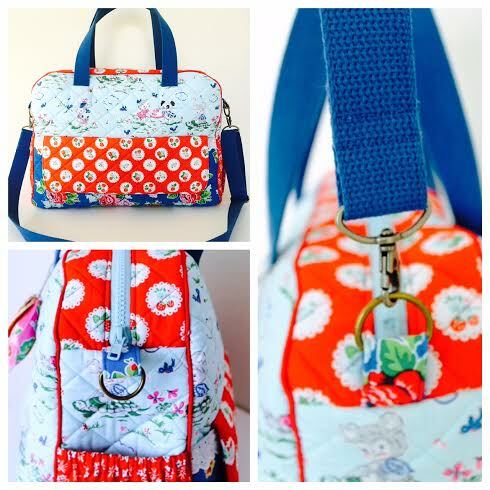 I added some cute lace details to maintain the dainty look and held it with a magnetic button enclosure. Next I made the back. I decided to keep it one color/style of fabric to make it cohesive. 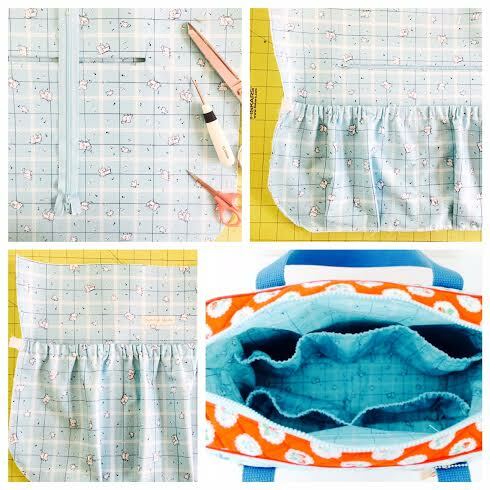 I added a large pocket with a zipper that can actually hold a full tablet or a changing mat. Lastly, I made the sides, top zipper panel, and bottom. 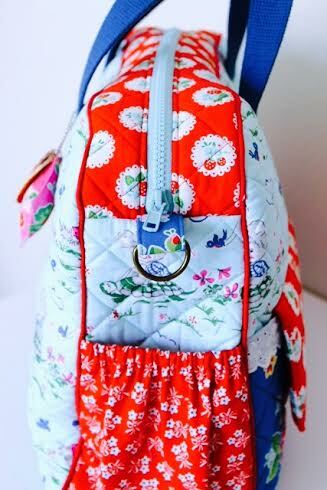 I added elastic pockets in a contrasting red fabric that can hold baby bottles and such. 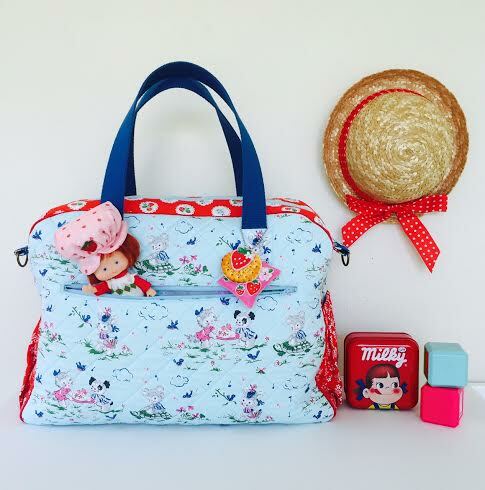 I sewed these all together to create the outer bag. Front, back, and side panels. Now the bottom, which is my husbands favorite part (yes, he gives great input to all my projects! ), I used the grey main rose print and added Pellon matte vinyl coating so to make the bottom durable and keep clean. I use this material when I want to add an oilcloth finish to any of my favorite fabrics for a special project. 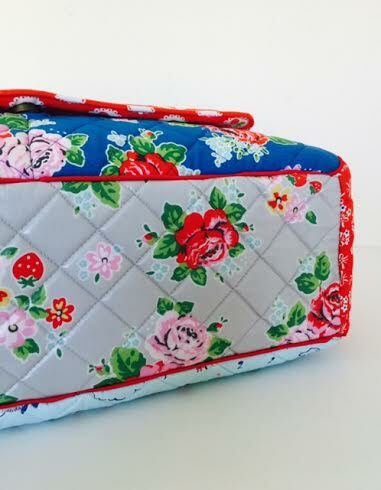 Bottom of bag made with Pellon Matte Vinyl Fuse for oilcloth finish. My favorite part of the bag is the zipper. 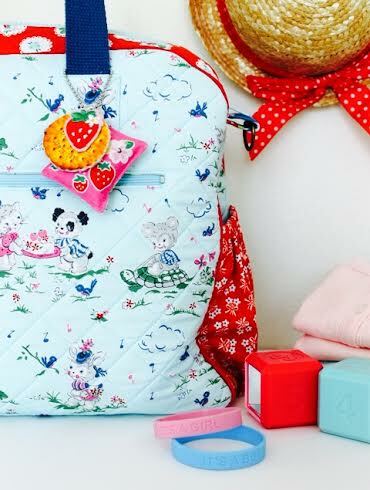 I used a heavy duty plastic YKK jacket zipper in baby blue to pick up the colors of the bag. 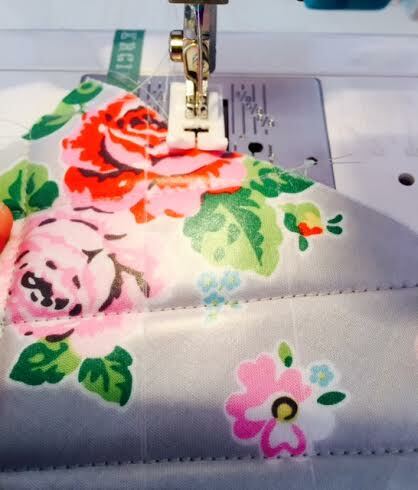 I think this is my new favorite zipper to work with because it's strong and easily sews onto fabric without puckering. Heavy duty zipper in baby blue. I then proceeded with the inner bag. I used the aqua birds print for the entire inside. I added elastic pockets to both panels so it can hold numerous bottles, diapers, wipes, clothes, and more. I also added a zipper pocket to hold a wallet, keys, and such. 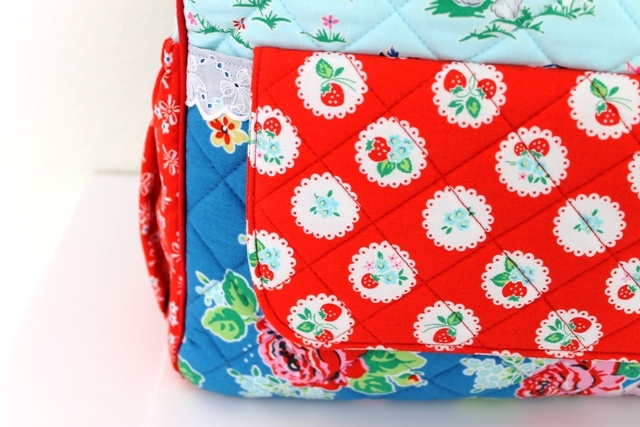 Finally, I sewed the inner bag, attached the inner to the outer, and hand stitched along the top from the inside. 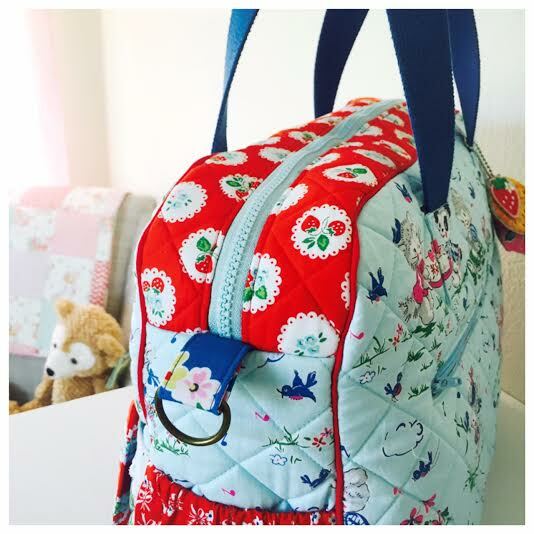 Inner bag panels with elastic and zippered pocket. Finished inside details. Drawing and inspiration for my design. Thank you for following my progress on my secret project! I hope you enjoyed it as much as I did making it. Strawberry Biscuit Fabric is super cute, fun, and a joy to create with and I can't thank Elea Lutz and Penny Rose Fabrics enough for letting me be part of this super fun Blog Hop! 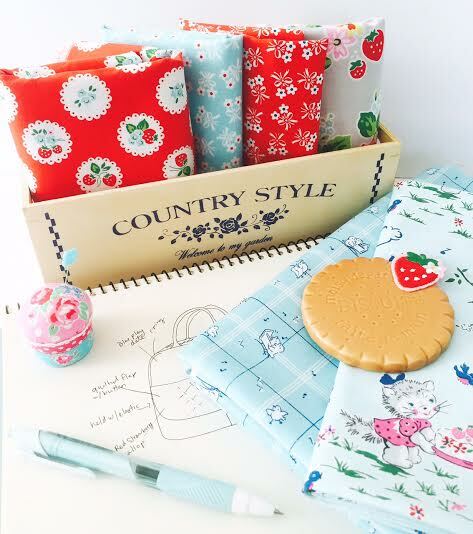 Strawberry Biscuit is available now in stores, so get some and make some cute things! 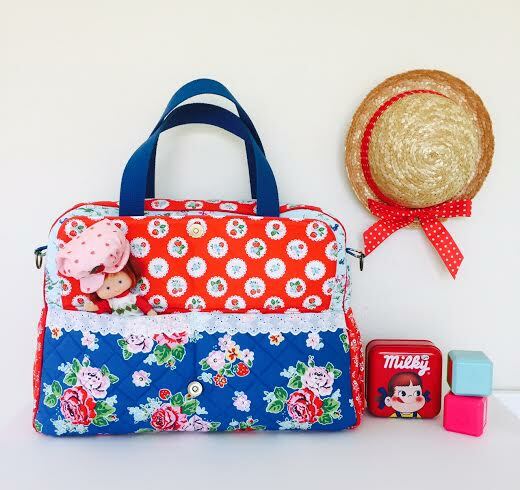 I can't wait to see what all the other lovely gals have created with Strawberry Biscuit! Hop over tomorrow and see what they made! I'll be there too! I'll be back on my blog in a week or so to showcase my twin baby nursery so stay tuned! I handmade some parts of it and I think you will like how I created it with Gender Neutral / Boy Girl in mind! See you soon friends!! 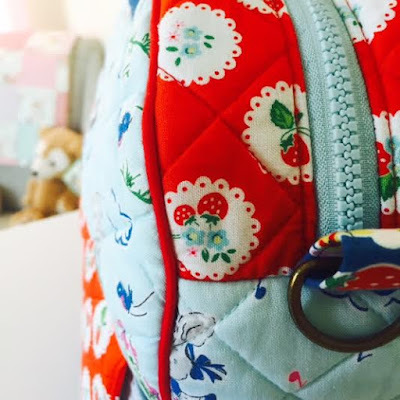 Sneak Peek Strawberry Biscuit Blog Hop! Hi Friends! 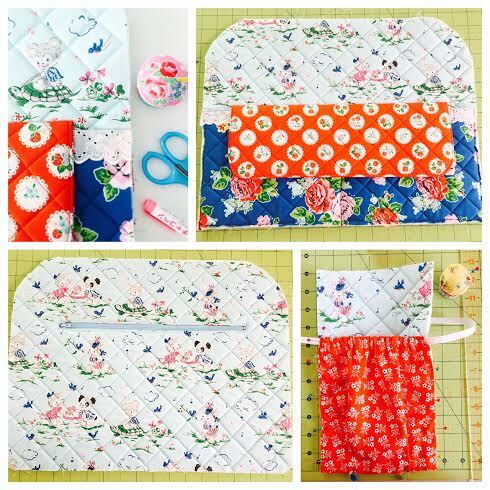 I'm participating in the Strawberry Biscuit Blog Hop this Monday, April 18! 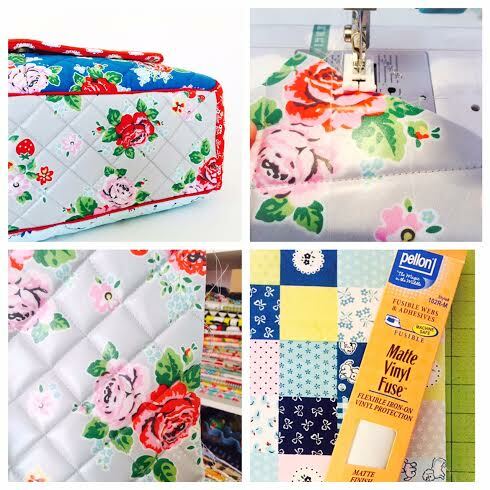 Be sure to check back here Monday morning and on my Instagram feed via creamcraftgoods! Here's a little sneak peek for to you to enjoy this weekend! !